The kitchen is moving right along...in fact it is finished!!!! after all it's only paint right?! and you might really regret not having that little extra "thing"
can you guess which lamps? Because it's been done over and over and over again! Hope you liked the tour! Looks fab. Great choice to go outside of the norm with paint choices. I love everything you picked... Looks gorgeous!!!! Thanks for sharing... Can't wait to see more pics! Good for you to do something different from the usual. I love everything you chose and can't wait to see the finished room. You have such an amazing talent! I am really considering soap stone for my kitchen, too. I love the look of it! I'm interested to read how yours "works" after you live in your kitchen for a while. Beautiful! OMG - beautiful color for those cabinets Kelley! I love the progression. I can't wait to see how it all turns out - I'm so glad I haven't done anything with my kitchen, because I'm getting A LOT of inspiration from you! I love it Kelley! I really wish I had considered using grey cabinetry! I do love my white, but grey is so darned elegant! And I do love my big soapstone farmhouse sink, but that stainless one will make such a statement and give the whole room that cool contemporary feel you are famous for infusing! It's looks amazing.... Can't wait to see more! You are so talented and loved your other kitchen so much. Looking forward to more posts. The kitchen project was my favorite house project. It took two years to complete but well worth it. 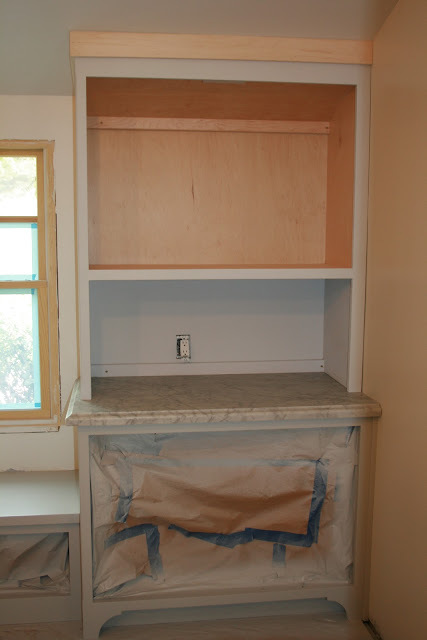 Your cabinet colour is amazing and the Carrera marble looks absolutely perfect with it. Your kitchen is going to be gorgeous! 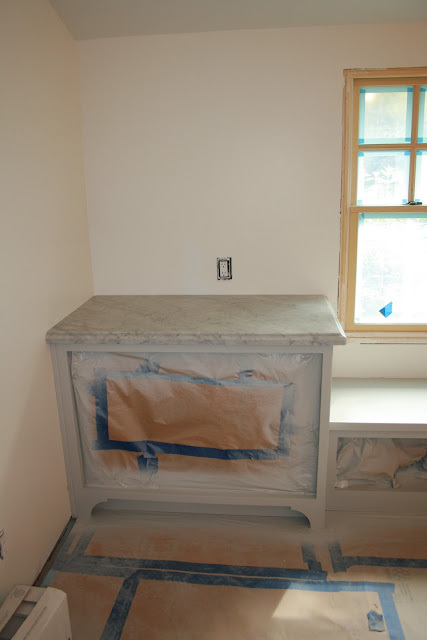 LOVE soapstone...love the sink...love it all! 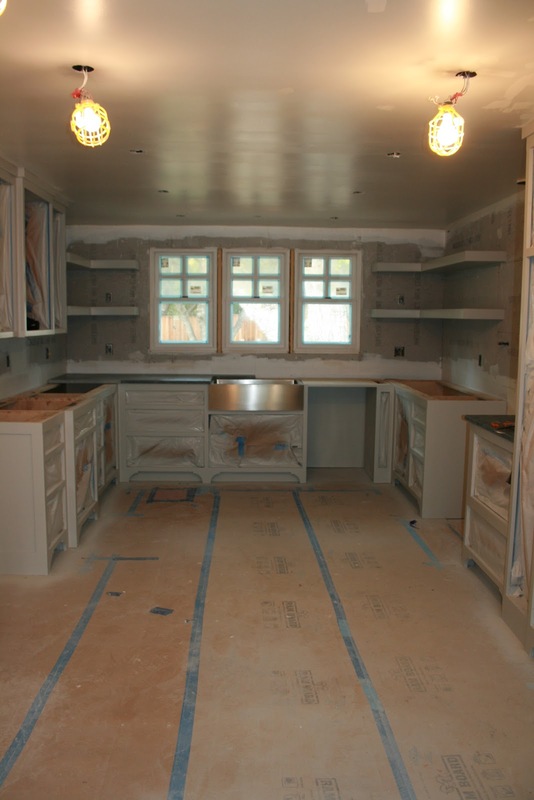 Kelley, Your kitchen will be fabulous! I love the gray cabinets and all your choices. LOVE your choice of paint. You can't go wrong with F&B! Oh...I know this kitchen is going to be gorgeous. Everything you do is fabulous. Can't wait to see the finished results. It is looking great. 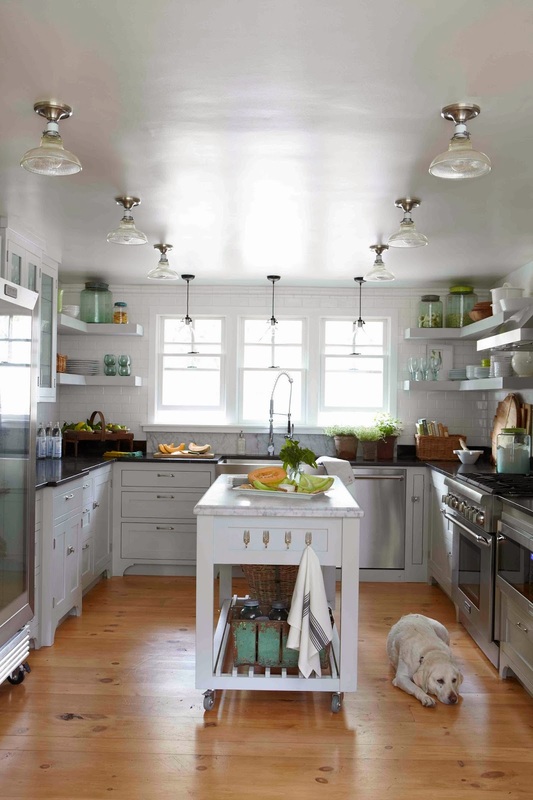 I love the FB lamp Room Grey, the floating shelves and you counter choices. 5-6 weeks isn't bad. I am into week 12 with no end in sight. Cannot wait to see your finished kitch -- and mine. It is so great , but that is no surprise your next kitchen would be amazing. I too am going with grey, and I am loving it. I chose Bedford Gray by Martha Stewart. I love a white kitchen but want to do something a little different but still subtle. Can't wait to see your kitchen all done. Oh It is going to be BEAUTIFUL!!! I can't wait to see it all done!!! That is one heck of an update! Your kitchen is looking fabulous. I love all the well-thought out and intentional details. Can't wait to see more progress. in the end! I agree 100%. Also, kudos for going with the stainless sink. I had always dreamed of the Shaw's and now find that it chips very easily and drainage is a problem, plus the company doesn't stand behind it. I love the idea of lamps and carefully planning your electrical. I let my electrician whom fancies himself a designer as well, by using the words, "Make it pop!" so often I thought I would strangle him if I heard it one more time. In the end I have cam lights with stainless inserts (he said for more light but it just blinds you). I had to have a dimmer installed. Oh the woes of remodeling. My best advise is to have trusted friends to go over everything with. Ideas and mulling them over and over is extremely helpful. Also, tell your electrician to install an outlet wherever you are going to put your Christmas tree, even if it's the middle of the room in the floor! Lovely not to have those cords to deal with and not more expensive if you do it during the remodel process instead of afterwards. I can't wait to see your finished project. Continued good luck! This is going to be beautiful! (as everyone else has said.) I hope you don't have to eat too many more microwave meals...they DO get old very quickly. 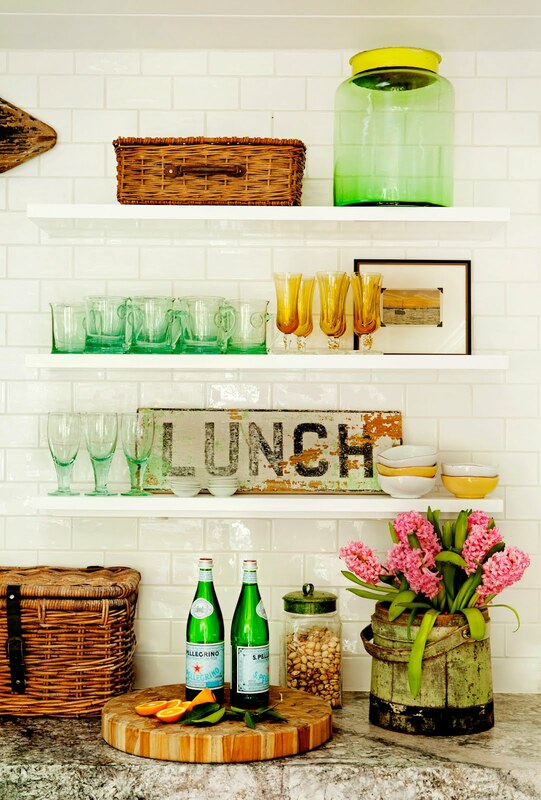 I love the idea of the lamps on the open shelves. It is so smart to plan ahead on those outlets. Can't wait to see more. I love everything I'm seeing...it's going to be gorgeous! You must be so excited. I can't wait to see what lamps you use on your open shelves. I'm very interested in hearing your paint color choices...sounds like very thorough research. 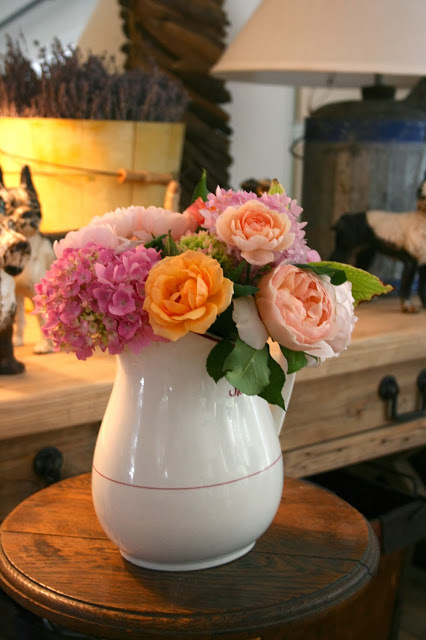 Good mornign...thank you so much for the wonderful comments and thoughts about the kitchen project! I didn't have much time to be near my computer yesterday but read eacha nd every one. So many people have comments about thow to do the shelving that I will do a post about that soon. Have a great day....off to work! Hi Kelley, I think your stainless sink is a wise choice. I have the Villeroy & Boch double farm sink, my farvorite thing about my white kitchen...but...it is set below the granite and it is china. As it scratches, ages, or, parish the thought, cracks...??? In Love! You did good!! Now that is going to be an awesome kitchen!! Those cabinets are fantastic! Love all your choices - esp nice to tie in the stone tops in the breakfast/eating area - I always like a "built in" feel esp. one that ties together with materials. I also love the stainless touches (esp the sink) as you are smart to add a touch of contemporary and practicality instead of cliche! As for electrical - I fully believe the lighting and proper wiring are SO important. Many folks don't really give it much thought but then when the room is too dark, the outlets too far or the switch is across the room - they regret it. Lighting has become my favorite part of interior design! wow!!!! 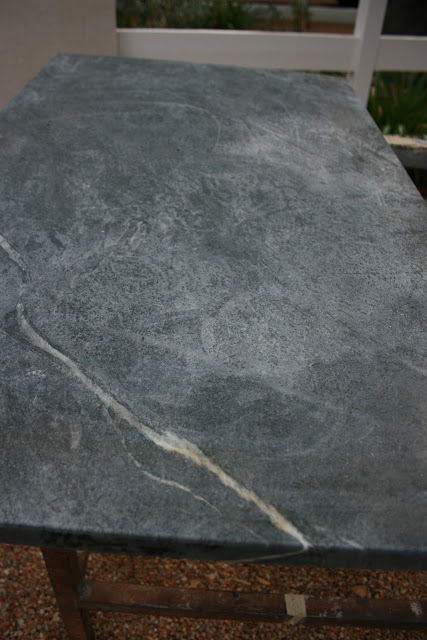 love the soapstone! and the sink. can;t wait to see it finished. looks so great. The method utilized to install the sink will depend on what type of sink you obtain. In the event you buy a drop in kind of sink, the method is fairly straight forward. It's remarkable to go to see this web site and reading the views of all colleagues about this article, while I am also eager of getting experience. Yes, washing those dishes in the garage! I've done that in all my renovations, and washed them in the bathroom sink and under the hose bib. Have just moved into my new kitchen with some disappointments. The expensive appliances are not as user friendly as the old stuff. I spent lots of coin for s super stove which I don't like to cook on. Nothing to do about it now. Your gray is just perfect. Everyone who sees your completed project will admire the thought and planning that you did. It's really beautiful.